Entirely Pets, online at EntirelyPets.com, is a company dedicated to bringing you the best and most affordable products for your pet’s health. With products for cats, dogs, horses, fish, birds, reptiles, and small pets, your purchase from Entirely Pets is sure to strengthen the bond between you and your pet. Save big on pet supplements, food, supplies, flea control, and more from the top brands such as Frontline Plus, Advantage, K9 Advantix, FURminator, Cosequin DS, Joint MAX, Bonies, Feliway, and the list goes on. Also, don’t miss out on amazing Entirely Pets coupons, Entirely Pets discounts, and Entirely Pets promotions at RetailSteal.com. Entirely Pets only ships U.S. FDA/EPA approved products. Ground shipping costs a flat rate of $4.95 per order, and shipping is free for orders of over $85. International shipping rates are more than U.S. ground shipping and may vary. See website for details and exclusions that may apply. Use the coupon code at Entirely Pets to save 15% on your entire order. Click to shop and save. Use this coupon code at Entirely Pets and save 10% on your entire order. Click here to shop. Shop entirelypets.com and get free shipping with the purchase of $85 or more. Click link to start shopping. Shop online at EntirelyPets.com and use coupon code to enjoy a $5 discount on orders $50+. 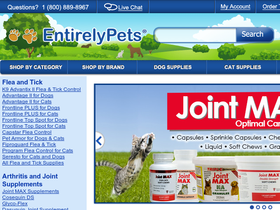 Enjoy a $5 discount on JointMAX supplements with this coupon code from EntirelyPets.com. Click link to save. Check out the sale specials on EntirelyPets.com and save up to 70% or more off a wide range of pet supplies. Click link now. Use this coupon code on Entirely Pets to save $6 on Joint Max. Click to save. At Entirely Pets, save $1 on any Quiet Moments product. Click link to save. Enjoy free regular bonies from Entirely Pets when you enter this coupon code at checkout. Get a free tube for any 12 pack of Frontline you purchase at Entirely Pets using the coupon code. Click link to shop.